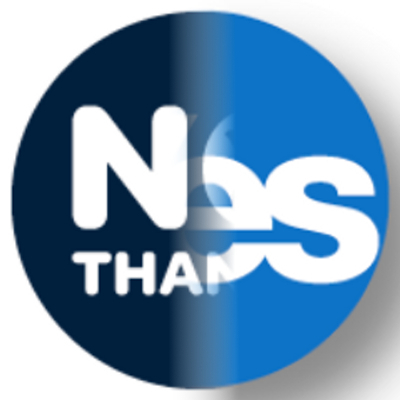 Dundee, August 22, 2014 (Alochonaa): What follows is a critical review of the main issues surrounding Scottish Independence, the pertinent evidence given by both sides of the debate, and a concluding cost/benefit analysis. I decided to do this because while I was researching the subject for myself, I couldn’t find a believably balanced argument from either side. Both frequently use the same source, and both definitely have pros and cons. For these reasons I have gone for an evidence based critical review, as far as possible using unaligned sources. No media outlets, blogs or unnamed sources. These are unknown, unaccountable and/or uninfluential (or at least of unknown influence), and therefore cannot be critiqued for use in such an evidence based critical review. Furthermore (spoiler alert) I won’t be finishing with my interpretation of where to go thereafter; that is up to each of you to decide for yourselves, my friends! (Although, those who know me will already know my personal decision). Please, if you feel I’ve missed evidence, disagree with how I have interpreted something, or just in general how I have gone about an area; send me a nice email with supporting documents or reasoning why, and I will get back to you. If it is good, then it goes in. I found there are three main focuses from those for independence: Improved economy, increased flexibility and fairer democracy. i.e., we would be; better financially, more able to respond to changing circumstances and better represented in government. I found there are three main focuses from those for the union: Strong economy, better stability and more influence. i.e., we would be; better financially, more able to keep business/homeland/foreign security and better positioned in a greater global role. Remembering this is just a snapshot of 2011/12 and all are of course subject to change year to year. The biggest difference is a higher percentage from North Sea Oil for Scotland, as compared to the UK. Otherwise they are broadly very similar. Economic figures: GDP and other values. Economies are judged on many estimated values. The most commonly known is Gross Domestic Product. There are different types of GDP and different ways of calculating them, but theoretically they should all be the same. Generally GDP is used as a quick measure of the economy, as it is a general term for the quantity of business performed within a year through the value of transactions. The Scottish economy is a strong one. To back this up, the Scottish Government preformed an analysis of an OECD report, using their Government Expenditure & Revenue 2013 figures. The Scottish Government’s report shows Scotland’s GDP per head [£39,642] as higher than the UK average [£35,671], and above in the OECD rankings for GDP per head. This has been contrasted by Glasgow University economists John McLaren and Jo Armstrong in a report claiming the figures were possibly misleading. In their study they also used GERS 2013 figures to analyse the OECD report, but using Gross National Income. GNI is similar to GDP, and is used to assess the money kept inside a country. Whereas GDP doesn’t discriminate where the business comes from or goes to, nor to which nation the income from that trade actually finishes. This is accounted for in GNI. The report puts Scottish GNI [£20,642] marginally below the UK average [£20,762]. The Office for National Statistics 2012 figures also show the Scottish economy is strong. Scottish Gross Value Added (used in calculating GDP) is above UK average, closely behind England’s, and higher than both Northern Ireland and Wales [GVA(i); Eng £21,349, Scot £20,571, UKavg £18,537, NI £16,531, Wales £15,696]. All the indicators are that Scotland has, as stated above, a strong economy. However, by the nature of things, it can only be assessed in context; as part of the wider UK economy. This is very significant as shown in the charts below, 70% of Scottish trade is with rest of the UK, whereas only 10% of the rest of the UK’s trade is with Scotland. Generally Scotland produces more tax while also having higher expenditure when compared to the UK average. The last five years of figures provided within the GERS 2013 are the most optimistic, but they are also the fullest figures to be entered into the debate. Therefore they have been reviewed with basic analysis of income minus expenditure per capita, and summarising with deficit comparisons and relative difference. Also historical data from previous GERS were compiled to show estimated net fiscal balance for UK and Scotland. Unfortunately, due to discrepancies between methods of reporting figures over the last 25 years, means there is difficulty in, and variability between, comparisons. Below are graphs, using the 2013 figures and show the relative deficits per person, and relative difference between % income and % expenditure from/to Scotland. 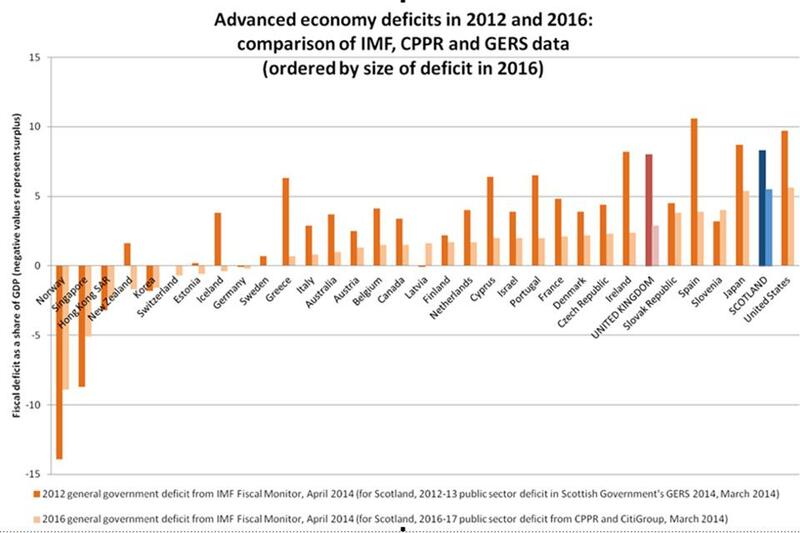 It can be seen from the graphs above that Scottish deficit per capita is broadly the same as the rest of the UK, albeit more variable. It can be seen from the historical data, below, that this is not a new situation. The relatively small difference shows that the Scottish economy is strong and extra taxes raised pay for the extra expenditure within the Union. Any claims, therefore, of either the UK or Scotland subsidising the other has no real basis in evidence. It can also be seen that the difference between the taxes raised and expenditure it received in the last 5 years is on average around +0.25%. As this is a figure marking the difference between two rates, a value is hard to assess. However 0.25% of 2012/13 GDP is roughly £135m, or £26 per person. Proponents of independence state that there are many policies Scotland would not continue (e.g. Trident, HS2/3), providing savings that could be diverted to other areas. Also that direct representation within some international bodies could increase the value of being a participant of said bodies, relative to the current representation as part of the UK. Of course this doesn’t for organisations where Scotland already has dedicated seats. A new state, they also state, would be a chance to make more efficient services like tax collection, to provide further savings. Proponents of continued union state there are many savings currently being made through the economies of scale within the union, pointing to smaller countries having proportionally larger governments and savings from sharing resources and government bodies, like a common home office and tax office. They state that these extra costs that would be due to the duplication of work would have to be diverted from other areas. There is value to both opinions, but also speculations as some assertions depend on future election outcomes. Proponents of maintaining the Union have posted evidence showing the possible extra costs and pressures on the state, businesses and citizens due to independence, and state that they want to keep the Scottish economy strong within the Union. Evidence to back these up relate mostly to credit rating, oil volatility, science and new technology funding, concerns raised by certain sectors and start-up costs. Proponents of independence have posted evidence showing amounts of oil reserves left, renewable wave and wind potential, growing sectors like whisky, the opportunity to create a more efficient government offices and more dedicated seats internationally for Scotland. The only real impartial evidence in this subject matter has come from the International Monetary Fund. They have looked at the Scottish and UK past balance sheets and future projections to produce predictions for future deficit levels. The graph below is from their report comparing advanced economies current 2012/13 and projected 2016 deficits. They predict that an independent Scotland will improve its deficit, but not to the degree of the UK as a whole. Figure from IMF report on advanced economy deficits. Of course one of the biggest issues of the debate will also be one of the biggest influencers of how an independent Scotland would look and perform. The first information to enter was from the Fiscal Commission Working Group, setup by the Scottish Government, who examined the options available to Scotland, if there were a vote for independence. Subsequently the UK Government has also released work similar in content. 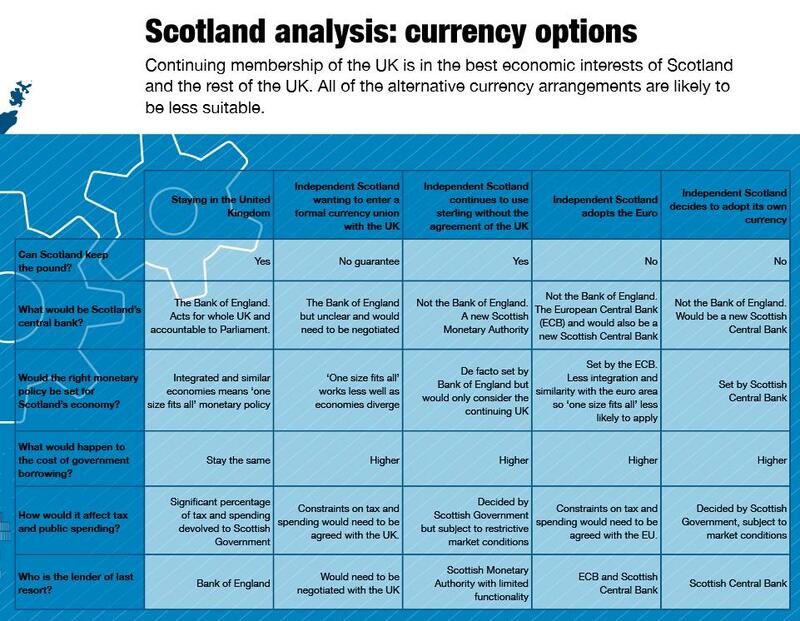 Despite the reluctance of campaigners to discuss options other than whether or not a sterling currency union would happen, there are other options, each with pros and cons. The descriptions of the options from each can be seen in the tables below (click for larger images). Since the publication of the Fiscal Commission Working Group’s analysis, all main UK political parties have stated that they would not consider entering a formal currency union. Pro-independence campaigners have stated they believe the position of no currency union is a campaign tactic that would change after the vote. Their position is that the UK would need oil reserves to keep the UK’s balance of payments, and that the burden of transaction costs would be on both Scotland and the rest of the UK if there were no union. 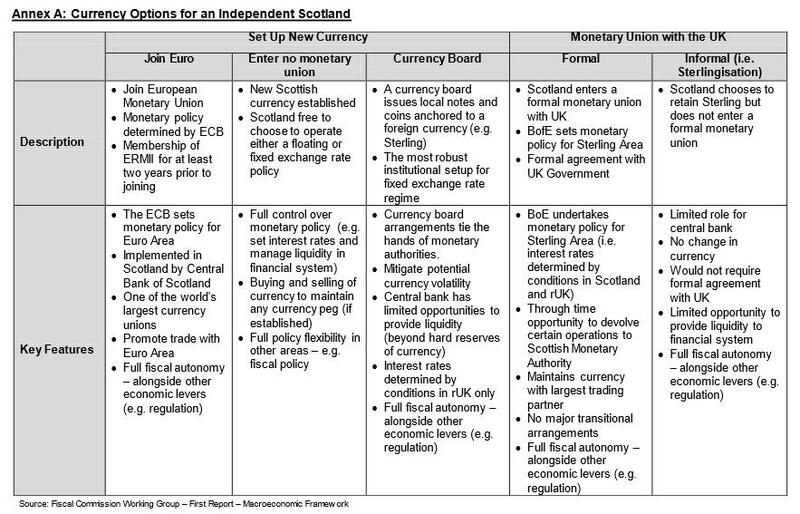 Also that if there was not a currency union then an independent Scotland would not be liable for any UK debt. The University of Glasgow’s professor of economics Anton Muscatelli said, “a successful currency union would actually be in the interest of both sides” and that most of the impact would be felt by the rest of the UK, and not Scotland. Indeed some believe no currency union, but still using the pound, could be better for Scotland, like Sam Bowman of the libertarian think tank The Adam Smith Institute and Professor Lawrence White of the Institute of Economic Affairs, who point some advantages of such an arrangement, despite extra costs. Pro-union campaigners have stated that a currency union would not work, and point to comments by Sir Nicholas Macpherson, the Permanent Secretary at the Treasury, stating “a currency union would not happen. It wouldn’t be in the interests of a separate Scotland and it wouldn’t be in the interests of the continuing UK”. Also the governor of the Bank of England, Mark Carney’s advice that, “a durable, successful currency union requires some ceding of national sovereignty” and, “an amount of political unification”, which the parties say would not in the best interests of either county, and somewhat contrary to the premise of the whole referendum. Pro-union campaigners say that in the event of a vote for independence, MPs for the rest of the UK would have to justify their actions to their voters, who have shown in polls not to be in favour of a currency union. The suggestion that an independent Scotland would not take it’s share of UK debt if refused a currency union has been described as a threat, and one which would have implications on the credit rating of a new sovriegn state. Just like personal credit ratings, countries credit ratings affect us in everyday life. As most of the population has debt, be it unsecured (e.g. overdrafts/card debt) or secured debt (e.g. mortgages), it affects us all, including businesses. To date there have been two international credit rating agencies to come into the debate: Standard and Poor’s and Moody’s. Standard and Poor’s were the first to release a report. 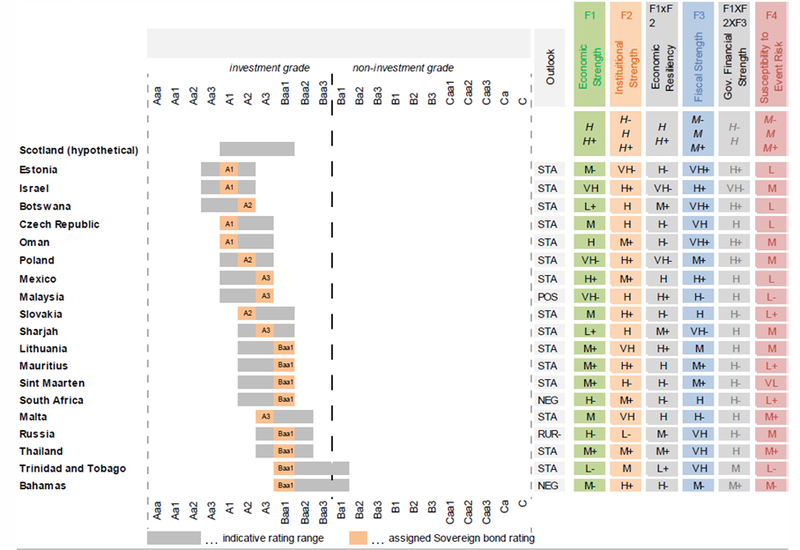 It made clear it was not a full rating profile, but that, “The macroeconomic profile of the wealthy and open Scottish economy conforms with the typical profile of sovereigns rated in investment-grade categories (i.e., ‘BBB-‘ or higher)”. They also stated that, “Scotland would qualify for our highest economic assessment…which supports creditworthiness”. S&P reported that in their view, “Scotland’s economic performance would be subject to several potential adjustment risks during its early years as an independent state” including a high %GDP from oil, bank held assets of 12.5xGDP and that 25% of the work force is in the public sector. It is also worth noting that both credit rating agencies also based this on a fair and amicable currency union with either the UK or Eurozone. It is difficult to relate how this would affect an independent Scotland, and especially the individuals within. The Institute for Fiscal Studies has indicated that this sort of credit change would most likely affect governmental debt servicing to the tune of 1-2% GDP. The IFS also indicate that all other debt, be it overdrafts, mortgages, credit cards or other loans, personal or business, by an additional 1-1.5% on interest rates to that of the UK. The Money Advice Service has a really good web based mortgage calculator. It was used to calculate the change for a 35 year mortgage at 4% going up to 5%, based on the average house price in Scotland as of June 2014 (£161,402) and a loan to value ratio of 90% (i.e. £145,262). A 1% rise in interest rates increases monthly payments from £644 to £734 (+£90) for a repayment mortgages, and £485 to £606 (+£121) for interest only mortgages. That’s £1080 or £1452 a year. The median salary in Scotland is £20862. That equates to 5-7% of the average annual income. As North Sea Oil has made up between 13-18% Scottish GDP over the last 5 years (more when seen from a longer history) it has been a popularly visited subject within the referendum debate. The main points are: how much is left, what will we get from it, what does increasing extraction/decommissioning costs mean for the future, and is the price volatility a big or small risk? Firstly some background. The first North Sea oil came ashore in June 1975 and production is thought to have peaked in around 1999, with more than 40 billion barrels extracted so far. Although the oil and gas are now tougher to extract, the reserves are substantial, and there are some fields just starting or about to start, and there could be new discoveries, such as the fields west of Shetland. When reports from respected bodies, companies and individuals range from 10 to 40 billion barrels left, and lifespans ranging from 15 to 60 years, it is easy to feel lost when trying to assess oil in this type of review, let alone in everyday life. Having said this, the aggregated opinion puts future oil between 15 to 25 billion barrels of oil equivalent – meaning possibly another 30 to 40 years of production. As stated above, there are many wide ranging predictions from many bodies etc. about how much oil and gas is left in the North Sea and what we can make from it. As this depends on extraction costs, international fuel prices and many other factors, these are constantly revised and reliably unreliable. For example, this graph shows how variable the OBR (one of the more variable) predictions have been in the past. This is common theme among all predictions from all participants. 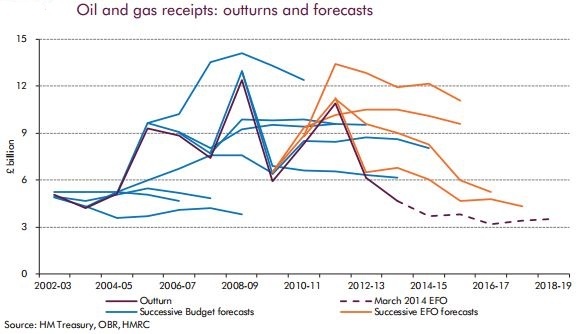 OBR past oil revenue forecasts and actual revenue. There are relevant points from both sides. There has been an increase in internal R&D investment within certain oil companies in an attempt to reduce extraction costs, and to possibly revisit old fields with more efficient technology. As with all businesses, technologies are well protected and there is no way of finding out the validity or the extent to which these would affect the oil production from the North Sea. However Scottish oil firms are among world leaders in exploration and extraction technology. There are also new fields being developed, most notably Chevron’s Rosebank Project, estimated to contain 0.25 billion barrels of oil, and Total E&P’s Edradour gas field, estimated to produce up to 0.9 billion barrels of oil equivalent over its predicted 15 years lifespan, at a rate of 17,000 barrels of oil equivalent per day at its peak. There have also been claims of possible other fields, however there have been no official sources provided of their possible future potential, or even of companies interests in said claimed fields. 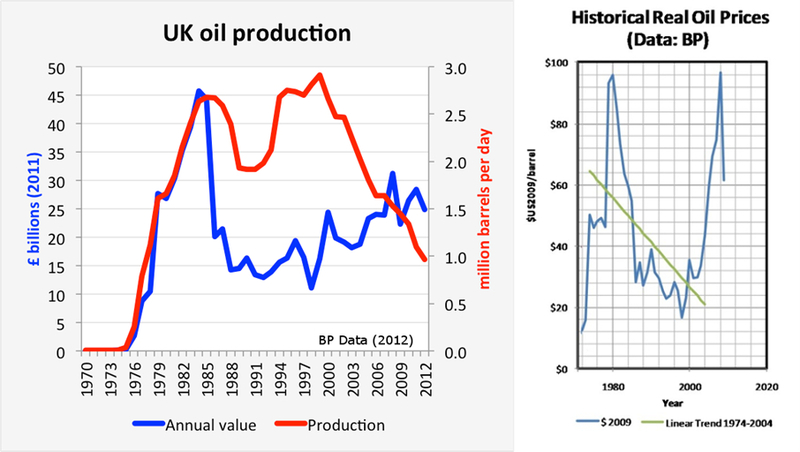 Even though there are new fields being opened and discovered, North Sea production has shown a year on year decline every year since 2000, as can be seen in the graph below. Revenues have been on a variable upwards trend; however this is due to high volatility in the international oil prices and not increased production, also seen below. Oil Production, Revenue and Prices over time. Having great oil reserves is an asset to Scotland, but as pointed on by both Moody’s and Standard and Poor’s, it also comes with a factor of risk due to that volatility. Pro-Union campaigners would point to the latest oil figures being below estimates by 44%, and the consequential loss of £4.3 billion of tax revenue to that expected; around the same amount as the total spend on schools in Scotland for that year. They also point to decommissioning costs which are currently aided by the UK Government. Pro-independence campaigners would point to oil-funds in countries like Norway, who can use revenue from the fund to smooth out fluctuations, as well as paying for other projects. This is of course dependant on future decisions by future governments, however the gains to be made from oil funds can be seen in Shetland, where they independently bargained a port fee on oil companies, and have invested the money made into a fund supplying many public services. It is obvious, but prudent to point out; any starting capital for an oil fund would have to come from current income, which as stated above, is in deficit. There are two main international points to consider. An independent Scotland’s terms within the EU and its place among other world bodies. Currently Scotland is represented as part of the UK in a wide range of international bodies. The majority of these an independent Scotland could enter, if she wished, without much issue and hold her own presence, albeit a smaller one: e.g. World Trade Organisation, International Monetary Fund, World Bank, and Organisation for Economic Co-operation and Development. There are some positions within these that the UK holds for historic reasons that won’t be discussed further. There are three international bodies which would be unavailable to an independent Scotland. Pro-Union campaigners point to these saying our international standings would be diminished. As a permanent member of the UNSC, the UK is involved in many issues of world importance. As members of the G7/G8 and the G20, the UK works closer with the other top economies in the world to address global economic issues, as well as getting to promote UK businesses to the top economies in the world. International embassies, business lobbyists and trade bodies are also of note. The UK and Scottish Governments currently provide these in the form of Scottish Development International, 270 UK embassies, the UK Foreign & Commonwealth Office and UK Trade & Investment. Pro-independence campaigners point to the extra representation Scotland would have in the bodies that would be available for us to join. Proposed plans are of course subject to the UK 2015 and the potential Scottish 2016 elections. It has been proposed that an independent Scotland would setup around 70-90 smaller embassies worldwide, would widen of SDI to cover the work done by UKTI and setup a Scottish FCO. There have been many legal opinions given proposing the terms of an independent Scotland entering the EU from both sides of the debate. Do not be mistaken, this is uncharted territory as far as the EU is concerned. Professor Sir David Edward, Aidan O’Neill QC and Graham Avery are just some who state Scotland would renegotiate from within the EU, based on the position the UK holds within the EU. They point out that having been in the EU for 40 years we already comply with EU regulations. This would mean negotiations begin with the template of the UK’s terms, i.e. Rebate, 66 opt-out clauses, funding arrangements, etc.. Also they say that the removal of Scotland from the EU would take away protection of EU human rights, in direct contradiction to the core principles and laws of the EU. They propose the use of Article 48 to amend the Treaty of the European Union over the 18 months after the vote and a succession would occur in current with the proposed independence date of 24 March, 2016. This timescale has been described as both realistic an unrealistic. However, many like Professor Kenneth Armstrong and Professor Sir Alan Dashwood take the opinion that an amendment of the Treaty on the European Union would create significant legal and political obstacles. Also that it would need the unanimous support from all 28 member states for each amendment to include Scotland as a signatory; i.e. treaties, opt outs, etc.. Those with this opinion also point to Article 49, which sets out the process for new additions to the EU which is already in use. As stated before, this is uncharted territory, and this review shall not go into speculation how the difference of opinions between the Commission and some legal professionals would be resolved, nor about the future of British nationality north of the border post-independence. However, the difference of opinions and their relative starting points to proceedings is relevant. If the Commission is serious, then a new Scottish government will have to make a choice: argue the succession starting point of negotiations, with the possibility of a disappointing judgement / maybe running out of time, or go for the swifter, but possibly less beneficial, entry under a negotiated application. There are other aspects to the EU that are also relevant to the debate. Regardless of how and under what terms an independent Scotland would enter the EU, there are some certainties when representation is concerned. It has already been stated that an independent Scotland would see an increase in representation in the European Parliament, from 6 MEPs to 8 or possibly 10 MEPs, and would gain a dedicated seat in the European Council next to all other member states. It has also been noted that an independent Scotland would hold a share of certain roles within the commission that are rotated around member states, instead of getting a proportion of the UKs posts. Statements from Lloyds Banking Group, Barclays and HSBC have all pointed to EU rules stating that a bank should be headquartered in the country where its largest customer base is located. EU Council Directive 95/26/EC was passed in 1991 after the collapse of Pakistani founded Bank of Credit and Commerce International with head offices in London and Karachi, but was registered in Luxembourg. The collapse was due to cross border fraud and money laundering. The aim of the directive was to ensure banks are regulated in the same country they have most of their operations in. Although untested in legal practice, it requires a bank to have its head office in the same member state as its registered office, and that these should be located where a group has most of its activities. This was also passed upon by Moody’s in their Susceptibility of Event Risk assessment for credit rating. They state that redomiciling of banks to the rest of the UK could decrease the risk to state, and decrease the Event Risk rating. They state that this could possibly help to strengthen the credit rating of an independent Scotland, as currently the assets held by the banks are 12.5x annual GDP. The loss to the economy would however mask any real benefit in lower interest payments. The rebate was bargained in the 1980s as a way to correct for the fiscal differences between member states. These differences come from EU agricultural payments, and the rebate is an attempt to correct what each country pays in terms of %GDP. The UK received £3.3bn rebate this year, £0.29bn of which was passed on to the Scottish Government. Pro-union campaign state a rebate would be part of the EU entry negotiations, and that it would have to be agreed with all 28 member states. As the UK is the only member to receive a rebate to correct for agriculture subsidies, they state this would be problematic and that Scotland would most likely not receive a rebate, but would instead contribute to the UK’s. This they claim, on top of additional EU membership fees, would cost an extra £0.5bn. Pro-independence campaign state that the rebate is calculated by how high a proportion of GDP is from agriculture, with the effect of bringing the UK’s net contributions back into line with those of France in particular, and not to put the UK in any privileged position. They state that even if Scotland didn’t secure a rebate of our own, as Scotland has a higher proportion of agriculture than the UK it has less need for the rebate. The Scottish Government claims it would receive £0.85bn extra from the Common Agricultural Policy. Currently Scottish Universities do not charge students from Scotland and EU countries for tuition fees. They are paid for by the Scottish Government. This has been one of the flagship policies from the Scottish Government, and has only a small population of people against; citing reduced funding from college courses to help fund the policy. This policy has entered the debate since Androulla Vassiliou, EU Commissioner for education, confirmed that in her view the continuation of charging students from England, Wales and Northern Ireland as an independent country outside of the UK would amount to a “covert form of discrimination”. It is worthy to point out that this was not official communication from the EU Commission, rather a personal interpretation of the anti-discriminatory EU laws. There have been law and EU experts agreeing, but no official statement. This claim has been countered by other law and EU experts showing cases in EU law where similar claims of discrimination were proved justifiable by the European Courts of Justice when they are supported by objective considerations, and are proportionate to the legitimate aim being pursued. Avoiding speculation on who is right, if it were decided to be discriminatory, it is could mean many students would come from the rest of the UK to get fee-free education, putting Scottish students at a disadvantage and thus negating the positive effects of the policy. Most notably this relates to renewable energy. Both the UK and Scottish Governments support and subsidise the industry, which has benefited the Scottish more than the UK economy. The projections provided for the industry have assumed continued levels of subsidisation from both governments post-independence. This is of course subject to negotiations, but on 1st July 2014 some precedence was set. Ålands Vindkraft, a Finnish wind power producer was in EU courts against the Swedish Government for not allowing the use of their subsidising scheme provided for its internal companies. The European Court of Justice ruled in favour of the Swedish Government and against the Finnish wind power producer. The ECJ stated that it meant EU member states can continue to limit renewables support schemes to within their national borders. Specifically in relation to concerns this went against the free market, the ECJ stated that in its view allowing such cross-border subsidising went against efforts to encourage subsidising the industry. They stated that in terms of renewable subsidy schemes, the greater goal is to encourage internal subsidisation from all member states, rather than cross-border. Renewable energy is an expanding industry in Scotland, and has great potential. Indeed both sides of the independence debate use it as a reason for their views. Estimates have up to 25% of Europe’s potential offshore wind and tidal energy and up to 10% of Europe’s wave power potential is in or off the coast of Scotland. There were roughly 12,000 jobs within the Scottish renewable energies sector in 2013. If these energies were more utilised, it would increase energy security and reduce oil-dependence. Pro-union sources point out that currently renewable energy companies are subsidised to build new, clean generators by both governments, and one of the most sensible places to build is in Scotland. Hence 33% of total UK renewable energy funding is currently spent in Scotland. Pro-independence sources point out that Scotland produces the majority of UK generated green energy, and say this means that continued UK subsidises for green energy helps them fulfil their commitments as well as increase energy security. This is rebutted by the fact that the UK imports more renewable energy from the Netherlands and Spain at a cheaper price. As one of the largest single contributors to the Scottish economy, as well as being a worldwide brand, whisky has been used a lot in the debate. Indeed the Scotch Whisky Association showed that exports in 2013 were steady at £4.3 billion, representing around 85 percent of Scottish food and drink exports and that it supports about 35,000 jobs across Britain. There have been two individuals from the industry expressing their opinion. Scotch Whisky Association Chief Executive David Frost, while maintaining impartiality, stressed the importance of strong political support from government, whether to influence European Union negotiations or press other countries for better market access. He stated that under both outcomes he sees a positive future for Scotch whisky. Ivan Menezes, CEO of Diageo, which controls 40% of Scotch whisky production, has said that conflicts over currency and new tax arrangements after Scottish independence could impede the current growth of the industry. Menezes advocates continued union, but doesn’t see independence as problematic. “We’re here to stay!” he exclaims, as if it were in doubt. He is joined by William Grant and Sons, who have donated to the pro-union campaign. There is currently no pro-independence whisky contributor. The Pro-independence campaign states that independence would give an unprecedented opportunity to showcase the Scottish brand internationally, which would aid the industry, and that the value of whisky is greater to the Scottish Government than it is to the UK Government. The Pro-union campaign states it is the strength of the UK’s trade diplomacy and having two government bodies fighting your corner which is so important to the industry. That it’s this strength that’s needed in the EU and in the World Trade Organisation, and often bi-laterally. In the case for independence there are those who voice that some VAT from whisky is lost when shipped from ports in the rest of the UK. Quantifying this is of some difficulty, but the pro-independence campaign put this figure as high as £1bn per year. This is countered by the fact that more than 80% of the whisky industry is owned by non-Scottish firms, adding to the difference between GDP and GNI as discussed above. National funding councils (e.g. the Higher Education Funding Council for England and the Scottish Funding Council), who provide block grants. Within this system, Scotland does well at attracting funding. Statistics vary, but it receives between approximately 10.7%-13% of UK Research Council funding compared with a population of 8.4% and total spending on scientific research and development in Scottish universities equates to approximately £180 per head (60% above the UK average of £112 per head). Independence would not harm funding through some projects like the EU’s Horizon 2020 programme for research and innovation as Scottish universities already compete within this market. The future of UK Research Councils and National Funding Councils funding would be subject to negotiations. Pro-independence campaigners, Academics for Yes, say that continuing the current arrangements for funding through established UK Research Councils would benefit both Scotland and the rest of the UK by supporting collaboration. They also promote the maintenance of a common research area with the rest of the UK, including shared access to facilities, shared research councils, and review by peers. Pro-union campaigners, Academics Together, point to the benefits of the current systems for funding and assessing research and for collaboration (including the “critical mass needed in modern science and research” and economies of scale). Also that there is little international precedent for such arrangements and that current collaborations would become international collaborations, with associated levels of risk, administrative effort and time not present in domestic collaborations. Academics Together also point to many world leading universities residing in the rest of the UK that could pick up the lost work. Professor Sir Peter Knight, President of the Institute of Physics, has also expressed concern of the ability for an independent Scotland to provide both the breadth and depth of current Scientific and Technological expertise if a common research area is not achieved. Professor Knight has expressed that if funding is focused on life-sciences and renewable energy technologies, as has been indicated, that other sciences (in particular physical sciences) would be disadvantaged. In his analysis he states, “Including induced and indirect effects through supply chains and downstream spending, physics-based sectors account for a total of £12.5bn of Scottish economic output, and 184,000 jobs”. He compares this to the finance sector that contributes £7bn and tourism that contributes £2.9bn to the Scottish Economy. Another subject area that has become heated in the debate and with a lot more speculation than real evidence. The Scottish shipbuilding industry is heavily reliant on UK orders, and supports thousands of jobs directly or indirectly. The basis of both sides is quite simple. Proponents of continued union state that no UK government has ever ordered a warship from a foreign country. They show that most ships are put together in the Clyde but manufactured in other places, and point to other shipyards in the rest of the UK that, with modification, could construct the parts delivered in a similar manner to now. They claim that EU market laws would require them to offer any future contracts to all other countries if offered to Scotland. Proponents of independence show that the UK orders many ships, albeit not warships, from international sources and that EU rules allow exceptions for defence contracts. They also point out that the skill base on the Clyde could be difficult to replicate, and the upgrades needed to cover the work performed on the Clyde would be costly. This is all massively speculative, and largely dependent on future UK government’s decisions if Scotland were to become independent. Future UK governments would have to weigh up their priorities, between increased costs to manufacture and maintaining the principle of homeland built warships. Firstly, some semantics: I shall not be continuing to call this a demographic deficit, as the issue is one of comparable representation within a democracy. How well or poorly represented a nation is within a democracy does not equate to more or less democracy. 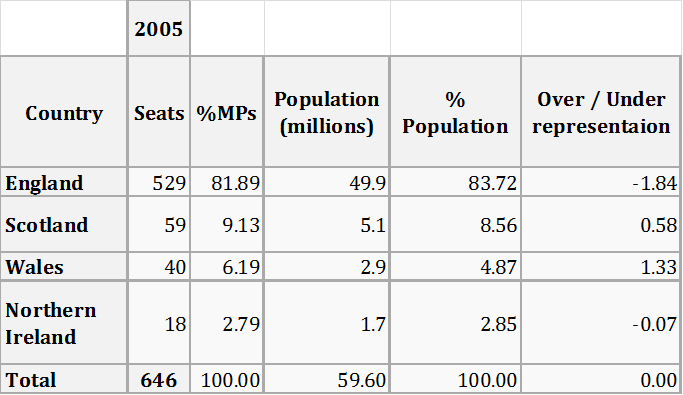 This is a comparison between proportions of the UKs populations to the proportion of representatives sent to Westminster. The analysis starts at 1997, as there were no significant changes between 1950 and 1997 and prior to that is not deemed relevant to this review. 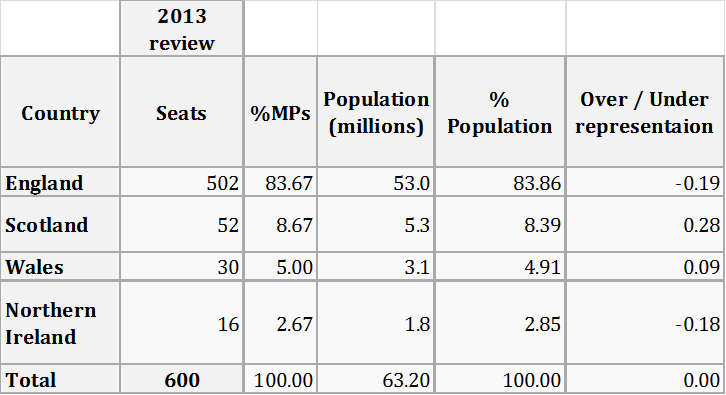 And as recently as last year there has been a review on parliamentary seat ratios. From the data it can be concluded that the proportion of representation has been changing, however it is a corrective change within this context. 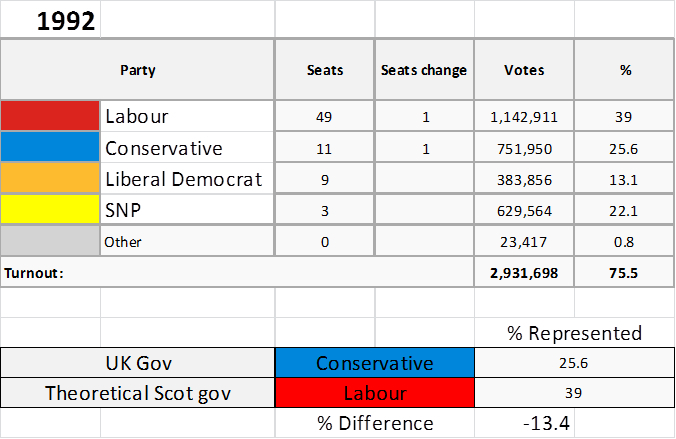 The number of MPs sent by Scotland has been reduced, bringing the % per capita towards the % of capita. 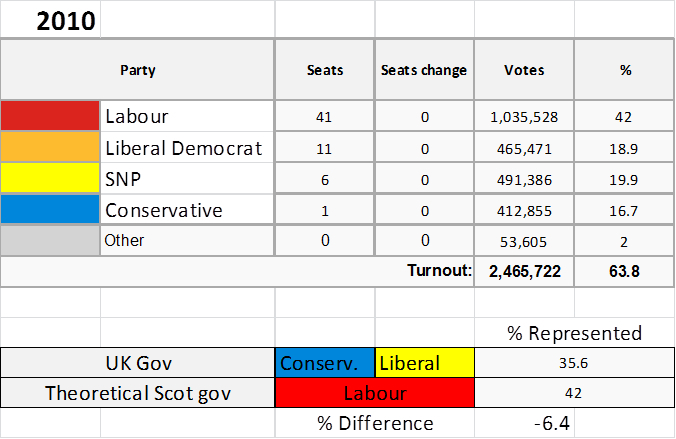 Here I shall discuss how well represented the elected UK government was to how well a theoretical Scottish government would have been. To do this I will be using the number of seats gained to determine which government would have been in power had Scotland been independent (i.e. Labour). 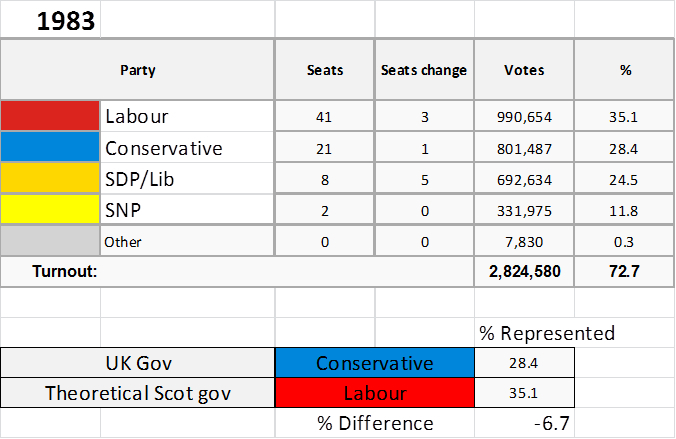 I will compare their % vote to the % vote for the incumbent UK government at the time to calculate how much more comparable the representation in government would have been. For this issue I feel the pertinence to dig a little bit further back in time than that for the rest of the critical review. 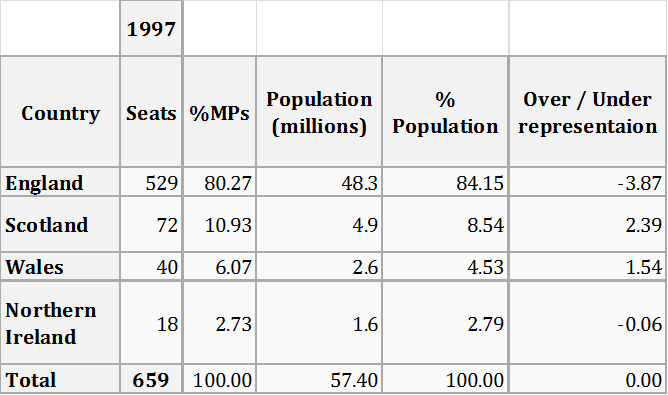 What follows is the analysis, as described above, for general elections from 1974 to present. 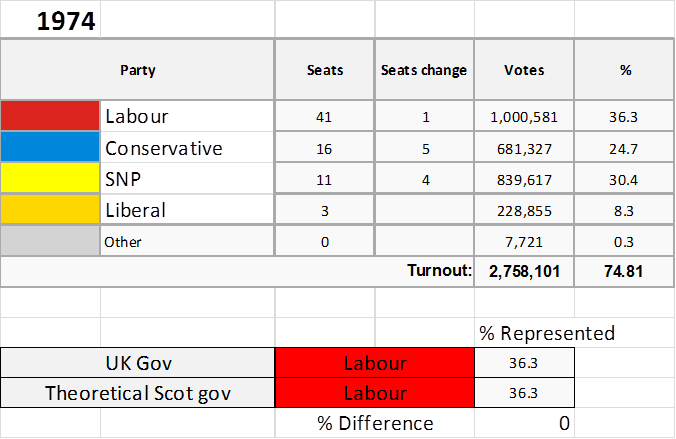 By examining these we can see that Scotland would have had a different government 5 out of the last 9 previous elections. 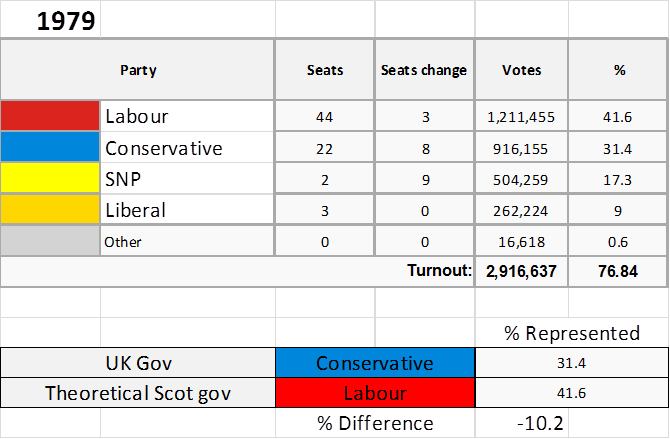 During this 40 year period the government of an independent Scotland would have represented on average 6.1% more of the population than the UK government at the time did. Over the last 20 years this figure is 3.9%. Over the last 10 years this figure is 2.1%. This is a significant difference of comparable representation. The Scottish Government (initially called the Scottish Executive) was formed in 1999 following the Scotland Act 1998. Over the next 15 years it has had increased powers and responsibility up to its current, provided under the Scotland Act 2001. The Scottish Government is currently responsible for collecting roughly 10% of taxes and controls around 60% of total spending in Scotland. These are across the devolved powers detailed below. Pro-union campaigners see this as an increase in fiscal autonomy, flexibility and holds higher accountability to the Scottish Government. They also point to the fact that this shows further devolution is happening at a consistent pace, without risk which may be averse to business markets due to unknowns. Pro-independence campaigners see this as too little too late, stating that it would increase tax raising powers, but only from 10% of income to 20%. They also point to areas where devolution hasn’t advanced, like defence, immigration and welfare, and that these are areas of control that are needed. 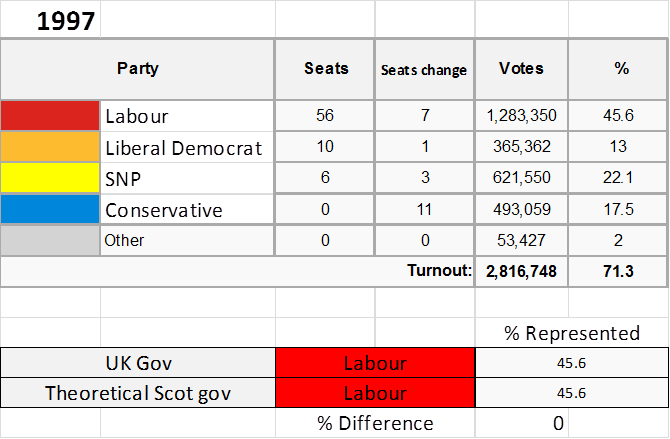 The last point on devolution is as to what might come in the future, provided a vote for staying in the union. All major political parties have released their visions for further devolutions, and each have seen their Scottish and UK leaders signing a letter of intent. The believability, and of course the direction, of what will happen is highly speculative, but each has broadly advocated devolution of differing amounts of welfare spending and income taxes; ranging from 40% to 100%. This is, as stated above, speculative and dependant on the next election, however Pro-union campaigners state that not following through after such solid assertions would amount to political suicide. Pro-independence campaigners point to the slow movement to devolution following the referendum in 1979. There are two competing views on the cost of setting up a new state. The Pro-independence campaign states that costs will be £200 million. The Pro-union campaign states it could be up to £2.7 billion. This difference by a factor of nearly 14 can seem baffling, and both have respected people backing their figure. Professor Patrick Dunleavy, politics professor at the London School of Economics, has backed the figures by the pro-independence. Professor Iain McLean, politics professor at Oxford University, has backed the figures by the pro-union. The two professors have had a back and forth between their blogs on the issue. The discrepancy comes from the undefined term “Start-up costs”. Dunleavy splits costs between straight-away costs, “start-up costs”, and costs that would be incurred at some later point, as “disentanglement costs”. Between the two of them they agreed on an accumulative cost of £1 – £1.7 billion over 2 to 3 years. A substantially larger home market for businesses and jobs. Lower comparable representation from government. 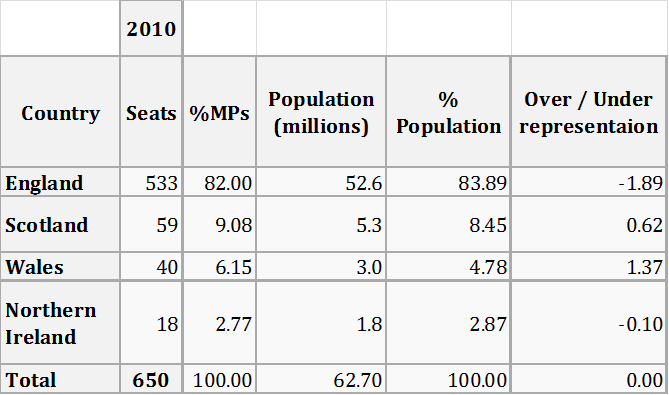 Increased comparable representation from government. Reduced credit rating and increased debt servicing costs. Certainty of currency, central bank, lender of last resort, etc. Apart from those from Scottish Government, policies aimed at the whole of the UK. Increased representation in EU and some other bodies. Most likely less beneficial EU terms. Maintain credit rating and low interest rates, and thus less debt servicing costs. In part providing funding projects for the UK as a whole (HS2, etc.). Full control over how income is collected and spent. Uncertainty over currency and the costs/restraints involved. Representation from two governments, trade convoys, etc. No dedicated seat in EU council, WTO, OECD, etc. Full focus on Scottish issues, home and abroad. More susceptible to fluctuating income from oil. Known extra devolution, inc. tax, through Scotland 2012 Act, and the possibility of further devolution providing greater autonomy. Unknown what and when further devolution will be given after Scotland 2012 Act. Dedicated, tailored policies (Immigration, defence, etc.). The possibility of banks redomiciling to the UK and the resulting large loss of income. Greater influence, as part of UK, within international bodies. Massive renewable potential, which could provide energy security. Reduced capacity to fund renewable energy projects. A proven research structure supporting innovation, with high levels of funding for Scotland. No representation in UNSC, G7/8 and G20. Greater network of embassies providing personal and business support in 270 countries. Costs due to setting up a new state. * Chris Elcombe is the incoming European Affairs Editor for Alochonaa. Chris is a 29 year old Scientific Officer from Dundee, Scotland. A keen Snowboarder, guitarist and self-proclaimed geek. You’re as equally likely to find him deep in statistics as you are chasing adrenaline highs, and having great fun either way.